Shred Guitar Zakk Wylde - Free Shred Guitar Lessons! 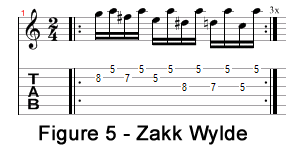 Here is the second part of the free Shred Guitar Zakk Wylde Lessons. Again Figure 7 & 8 you will recognize from my Pentatonic Blues Scale page. All of the guitar lessons contain audio at three different speeds so you can play along no matter what skill level you are at.